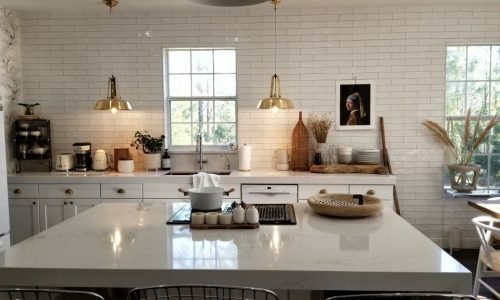 Selecting Kitchen Countertops: Orlando kitchen worktops need to be Functional, Tough and Beautiful enough to compliment the home. In a working home, we expect a lot of our kitchens; our kitchens store the food that we eat, provide a working space for preparing meals and bring guests together for entertainment. 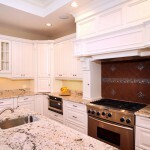 We count on our kitchen countertops to hold up to wear and tear, withstand hot and cold items, and look amazing. When sitting down and selecting kitchen countertops, the goal is to find the best balance for your kitchen based off of your individual needs. Quartz Countertop Material – Quartz provides the most functional countertop material as it is the most resistant to scratching and chipping. Quartz countertops are the most resistant to spills and stains due to its non-porous structure, and it does not need to be resealed every few years. Solid Surface Countertop Material – Solid surface material is highly durable but can be scratched. Since solid surface materials are non-porous, they hold up very well to spills and stains compared to other materials. Solid surface material should not be cut on directly. Granite Countertop Material- Granite countertops can withstand temperatures of up to 200°C (392°F), making them the best stone countertop material for placing hot pots and pans directly on. Granite countertops can be cut directly on without scratching the surface. Solid Surface Countertop Material- Solid Surface countertops (specifically Corian brand) can withstand 180°C (352°F) making them safe to place some hot pots and pans directly on. Solid surface material should not be cut on directly as the material will likely scratch. Quartz Countertop Material- Quartz materials can withstand temperatures of 160°C (320°F) making it okay to place some warm pots and pans directly on the surface without cracking. Quartz countertops are tough enough so that can be cut directly on without scratching the surface. Marble Countertop Material – We were not able to find an exact temperature at which marble will crack, but due to the soft composition of the material it is likely that hot materials. Quartz Countertop Material – Quartz countertops come in a wide variety of colors, textures, and functionality. Since they are man-made, they can be replicated to match granite and marble stones, and even Concrete Countertops. 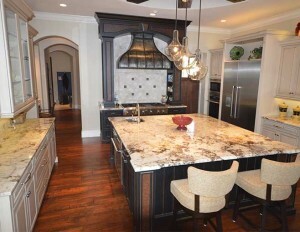 Granite Countertop Material – Granite is a natural stone that comes in a wide variety of random colors and textures. Granite is supplied from around the world, granite materials from different regions can create different patterns, refraction and colors. Solid Surface Countertop Material – Solid surfaces material is a synthetic material made of acrylic that can be used to replicate quartz, granite, marble and more; however it usually does not have the same feel or finish as a natural or quartz countertop. Marble Countertop Material – Marble countertop material comes in very little selection of color, however the material is visually stunning and has a wide variety of natural patterns.